Charlie Bates Cottage is an iconic part of Penneshaw's history. The cottage has proudly stood watch over the beautiful shores of Hog's Bay for more than 110 years. An original limestone settler's cottage, it was built for Charles Bates, son of Harry Bates. Both father and son with their extended families made an amazing and very colourful contribution to the early settlement of the East End of Kangaroo Island. They each took on the Postmaster's tender, which saw the men responsible for delivering the Island's mail services by boat and horseback from the mainland. An arduous journey. Charles was one of 9 children from Harry's second marriage that helped build a bullock track from Antechamber Bay to Penneshaw (which can still be seen today on the Baudin Conservation Park Walk) as well as engaging in various farming and other entrepreneurial pursuits to forge a living in the harsh conditions that were part of early Island settlement. Once the only homestead on a large landholding in Penneshaw, the cottage still remains today even though the town has been been significantly populated....in Kangaroo Island terms that is! Nestled on a large, sloping block she boasts magnificent ocean views, is conveniently located only 2 minutes from the Sealink ferry terminal and a very short walk to the safe swimming beach at the end of the road. Charlie's has been lovingly restored and refurbished to provide our guests with all the conveniences you need to experience a truly memorable holiday. We offer the perfect base for couples, families and friends travelling together so you can experience the very best that Kangaroo Island has to offer from the comfort of somewhere that feels like home. Our guests often comment they never want to leave. A modern extension to the original settler's cottage consists of a fully equipped kitchen including a full size fridge/freezer, microwave, quality kitchenware, a dining area with ocean views, laundry (with washing machine and clothes dryer), spacious heated bathroom with separate shower, clawfoot bath, and an additional toilet. These facilities and our wonderful location combine to make this unique piece of Kangaroo Island's history the ideal base for your getaway. Charlie Bates Cottage is a T-Qual and National Australian Tourism Association Accredited property. YOUR STAY AT CHARLIE'S WILL MEET EVERY IDEA OF THE PERFECT HOLIDAY!! Perhaps you are looking for the ultimate romantic getaway, somewhere to share a special weekend away, propose to your partner or a charming and private honeymoon destination. Curl up in front of a stunning, original open stone fire place that has warmed generations of Islanders with a delicious Island wine and your love in the cooler months. CHARLIE'S IS THE ULTIMATE DESTINATION FOR A SENSATIONAL SUMMER HOLIDAY FILLED WITH SAND, SUN AND FUN. Grab beach towels and head off on an easy 3 minute walk to the end of the street to spend the day having a fantastic family experience swimming and building sandcastles on one of the safest swimming beaches on the Island, Hog's Bay. Dolphins frequent the bay and you might be lucky enough to spot a seal swimming in the waters around the jetty. ALLOW YOUR SELF THE OPPORTUNITY FOR DOWN TIME...YOU CAN DO AS MUCH OR AS LITTLE AS YOU LIKE. Have a day off from touring and watch a selection on great movies from our extensive DVD library on the the LCD TV, (or just put one on for the kids so Mum and Dad can have a well deserved break!) read a book, play board games or enjoy time with your loved ones. Adults and children alike will delight in the opportunity to feed the wallabies and spectacular blue wrens on the lawn. Tammar wallabies visit the cottage every night looking for a tasty treat. Stone fruit and bananas are a favourite along with leafy green vegetables. An intimate wildlife experience for all of our guests. The Penneshaw Penguin Centre is located just a short walk around the bay and provides a fantastic opportunity to observe the local Fairy Penguins in their natural habitat and gain an insight into the life of these beautiful and mysterious seabirds. Try your hand at fishing off the Penneshaw jetty or the Rocks for the famed King George Whiting or jag a Squid. Charlie's comes equipped with fishing rods free of charge for your use. Alternatively we can put you in touch with professional charter operators so you don't miss out on the catch of a lifetime. Simply relax on the verandah with your favourite glass of wine and watch the sun set over the ocean or the comings and goings of the ferries.. Sink into a bank of pillows and decide you are NOT getting out of bed today. Fire up the BBQ on the verandah and enjoy some prime Island Southbank Lamb or a snag with 180 degree views with your dinner, lunch or breakfast. If there's one decision you wont regret this year, Charlie's on Kangaroo Island is it!! STAYING LONGER THAN A WEEK? ENQUIRE ABOUT OUR EXCELLENT REDUCED RATES FOR LONGER BOOKINGS. PLEASE NOTE: $135 is our base rate for 2 guests off season. Additional guests are @$20 per person. WE DO ACCOMMODATE 1 NIGHT STAYS HOWEVER THESE ARE $200/NIGHT FOR UP TO 4 GUESTS. 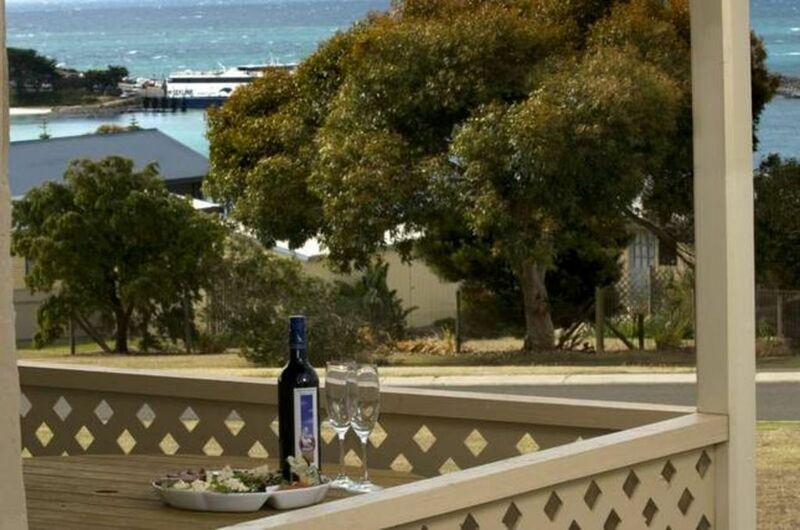 A picture book seaside village, Penneshaw is the ideal location for your stay on Kangaroo Island. Superb swimming beaches, stunning scenery, fantastic fishing, abundant wildlife and a well serviced town centre are just some of the attractions Penneshaw has to offer. Just at the end of the road from Charlie's, Hog's Bay Beach is a great place to swim, see dolphins or the occassional seal at play and has excellent grassed BBQ facilities located near the Penguin Information Centre and ferry terminal. The centre is open nightly for tours featuring Penneshaw's cutest residents, the Little Fairy Penguins. Tammar wallabies roam the streets in the evening, stopping at Charlie's for a munch on the lawn of some fruit. The Penneshaw Hotel and Sorrento's Restaurant offer quality meals with ocean views, or after a hard days touring if you don't feel like cooking or eating out, there are several take away options including a pizza bar and fish and chips. Pack a picnic and stop at Chapman River on your way back from Cape Willoughby Lighthouse, sample wines and local produce at Sunset and Dudley Wineries or fish for the famed KI King George Whiting on the jetty. What ever your idea of the perfect Kangaroo Island holiday you're sure to find it at Charlies in Penneshaw. With so much to see and do in the Penneshaw area, you could be tempted to never leave, but if you decide to discover everything the Island has to offer, all the Islands attractions are within an easy day's driving return trip from Charlie's. To ensure your safety, when planning day trips make sure you allow enough time to return home before dusk, as this when many of the Island's wildlife species become active. WE DO ACCEPT 1 NIGHT BOOKINGS FOR THE FLAT RATE OF $200 FOR UP TO 4 PEOPLE. ONE NIGHT STAYS ARE NOT $135. All pricing is inclusive of linen, firewood, GST and cleaning charges. The pictures look very lovely - like a 5 star hotel - but we were disappointed by our experience. The house is very run down and unclean. Dust everywhere - not good for those with allergies. I spent several minutes dusting off my pillow and bed sheets (not sure when they were cleaned). There were missing basics which I would have expected: shampoo/conditioner, soap/body wash, dish washing detergent, foil/baking paper. There were unexpected "visitors": bugs of every sort crawled into our beds. Mum and I were bitten. Killed several. I couldn't sleep the first night because I was paranoid a whole bunch of bugs were crawling on me. The AC did not reach my room - it was really hot (> 35 degrees). The AC is located in a very random place in the house. On the plus side, the view from the house is amazing. Can see the beach. There were fishing rods, which was unexpected. But I would have swapped these extras with the basics (mentioned previously). Structure needs a bit of attention as a lot of old places often do (salt damp and cracks), but other than that was one of the nicest places we stayed on the island. Good location. Good kitchen setup & bathroom. Lounge ok. Comfy beds and enough storage. Everything clean and tidy. Would definitely stay there again. Had 3 fantastic nights during July. The children loved the bunk room and the roaring fire at night. Great choice of DVD’s and very comfy couches made nights enjoyable. Best part was sitting on veranda with glass of red watching the ferry arrive and depart. Great location with a lovely view. Thankfully the beds were comfortable. The cottage is quite run down inside and hasn't been maintained well, needs a thorough clean inside. We still enjoyed our holiday, but wouldn't book another stay here. Cottage is well located with great views, 5 min walk to beach and working kitchen and bathroom. But needs TLC. Very run down and needs a good clean and fix.